After going on trails for several times, I feel unhappy with some actions of the trail users. The rubbish was being dump unconsciously? Or there is no rubbish bin and you think doing such thing is more convenient? No matter how, rules are rules. Please obey the basic rules when you are in the forest or trails. 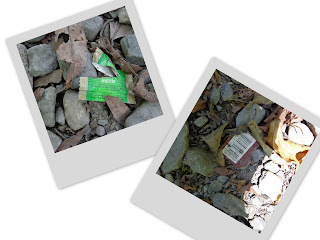 I would like to share some examples of “treasures” which I found during my trekking. 1st, food packing and plastic bottles. The glowing object is nice when being seen from far. What would you feel if you get nearer and find that it is actually a rubbish left by someone irresponsible? If the little creatures in the forest eat the rubbish accidentally, or may get trapped in it, their life may come to an end and can you take the responsibility when you harm one’s life? 2nd, cigarette end. If you are a smoker, please do not smoke in the forest. The cigarette end that you throw away right after you finish smoking is still glowing. What if the end is thrown on dry leaves? This might light the dry leaves up and cause forest fire. Please think twice on this matter as this can harm a lot of parties in many different ways. 3rd, tissue paper. Although the tissue paper can be dissolved, the process can’t be done in a few days. Same question, if there are small animals eat up the tissue paper accidentally and die of it, are you going to take the responsibility? The best way is to use handkerchief instead of tissue paper as it can be recycled and used for many times. 4th, shoe sole. This really sounds ridiculous. Please do pick up your worn off shoe sole and do not leave it for the forestry volunteers to clear it for you. 5th, towel. This is another thing which makes people feel like laughing for no reason. Is it because it is dirty and you do not want to wash it anymore? Please do not throw such thing on the trail and be so disrespectful to the nature. Everyone has to be responsible on protecting our Mother Earth. Please be responsible on the rubbish you created. Bring it out from the forest and throw it in the rubbish bin.